This disc is something of a follow up to violinist Simon Smith's previous Resonus disc, solo violin music by Bartok and Kurtag (see my review). On this new disc, Smith is joined by Clare Hayes (violin), Paul Silverthorne (viola) and Katherine Jenkinson (cello) in a programme of duos and trios, Kodaly's Duo for Violin and Cello, Op.7 and Serenade for two violins, and viola, Op.12, and Dohnanyi's Serenade for String Trio Op. 10. Between 1909 and 1920, Zoltan Kodaly composed two string quartets, the sonata for solo cello, the sonata for cello and piano, the duo for violin and cello, and the serenade for two violins and viola. And in the subsequent four decades, he wrote no further chamber music. The works written between 1909 and 1920 however are of great importance in Kodaky's output and it is in this chamber music that Kodaly really found his creative voice. 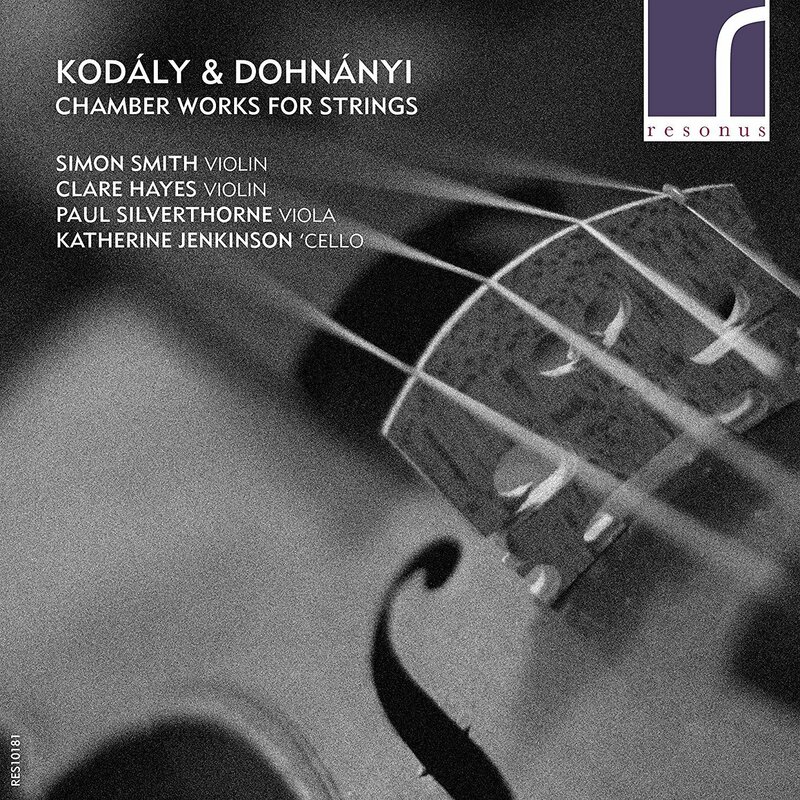 The sonata for solo cello is well known, and on this disc Simon Smith allows us to hear two powerful companion works where Kodaly integrates folk-influence into his own distinctive voice. The Duo for Violin and Cello is a big work, three movements lasting just under 27 minutes. From the opening of the lively Allegro serioso, non troppo we notice Kodaly's inventive texture, with one instrument taking the lead and the other commenting, but the two changing roles constantly thus bringing great variety, and deceiving the ear about how many players there are. The main material is lyrical, folk-inflected but in Kodaly's hands it becomes quite strong and certainly not lazily folkloric. The Adagio begins quietly concentrated, and rather melancholy. It is an intense and rather spare movement, but then the passion ramps up and the players really make the music bite. The end is quieter, but certainly not easier. The finale starts with a rhapsodic violin cadenza, before the vibrantly busy movement proper starts. Here moods are changeable as are emotions, leading to a vivid ending. This is a terrific piece and Simon Smith and Katherine Jenkinson bring out the complexity of the work, emphasising the strength. Kodaky's Serenade for two violins and viola seems to have represented a personal challenge to write a work without bass line. In both Kodaly's works on the disc it is tempting to align the music with external circumstances, the duo being written at the outbreak of World War One, the serenade when Kodaly's teaching career at the Liszt Academy in Budapest hung in the balance, for no fault of his own. The serenade is somewhat more conventional than the duo, but no less inventive. The opening Allegramente comes over as a fairly conventional Hungarian dance, but Kodaly's instrumental writing is imaginative and the textures highly varied. The Lento ma non troppo is quieter, but rather more striking with its fragmented textures and spare writing, illuminated by moments of intensity. The final Vivo opens with a bang and develops into something more rhythmically folk-ish. Kodaly's older contemporary Dohnanyi was more aligned to Austro-Hungarian tradition than Kodaly and Bartok. Dohnanyi's Serenade for String Trio dates from 1902, one of the first works where he found his voice. There is little of the voice of Hungarian folk-music here, instead we have five short yet characterful movements, starting with the brightly cheerful march with its more stereotypical quasi-Hungarian elements familiar from 19th century music. The Romanza is delicate and lyrical, at first but then develops some real passion in the middle section. The Scherzo is perkily characterful, with a sly edge to the music, whilst the Tema con variazioni is beautifully constructed with some lovely moments in the contrasting variations. The Rondo finale is brisk and breezy in an almost Grainger-esque manner. The works on the disc provide a nice contrast in styles and attitude, representing the development of Hungarian music. Whilst I enjoyed the Dohnanyi, it is for the terrific performances of the Kodaly that I will return to the disc.